My 2D isometric game uses a hexagonal grid map. 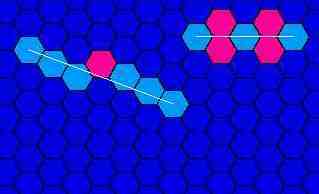 In reference to the image below, how do I rotate the light blue hexagon structures by 60 degrees around the pink hexagons? Main hex is (0,0). Other hexes are children, count of them is fixed. I'm going to define only one position (in this case its right) and calculate other directions if needed (left-bottom, right-botom, right-top, left-top and left). Other hexes are defined like: Package.Add(-1,0), Package.Add(-2,0) and so on. As Martin Sojka notes, rotations are simpler if you convert to a different coordinate system, perform the rotation, then convert back. I use a different coordinate system than Martin does, labeled x,y,z. There's no wobble in this system, and it's useful for lots of hex algorithms. 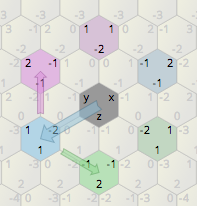 In this system you can rotate the hex around 0,0,0 by “rotating” the coordinates and flipping their signs: x,y,z turns into -y,-z,-x one way and -z,-x,-y the other way. I have a diagram on this page. So (X=-2, Y=1) rotates 60° right into (X=-2, Y=-1). Let's first define a new number. No worries, it's an easy one. Or, to put it simply: f = √3 × i, with i being the imaginary unit. With this, a rotation by 60 degrees clockwise is the same as multiplication by 1/2 × (1 - f), and rotation by 60 degrees counter-clockwise the same as multiplication by 1/2 × (1 + f). If this sounds strange, remember that multiplication by a complex number is the same as rotation in the 2D plane. We just "squash" the complex numbers in the imaginary direction a bit (by √3) to not have to deal with square roots ... or non-integers, for that matter. We can also write the point (a,b) as a + b × f.
This lets us rotate any point in the plane; for example, the point (2,0) = 2 + 0 × f rotates to (1,-1), then to (-1,-1), (-2,0), (-1,1), (1,1) and finally back to (2,0), simply by multiplying it. NORM: (x, y, w) -> (x + floor(w / 2), y, w mod 2), with the "mod" operation defined such that it only returns positive values or zero. Transform our points (a, b, c) to their positions relative to the rotational centre (x, y, w) by calculating (a - x, b - y, c - w), then normalising the result. This puts the rotational centre at (0,0,0) obviously. Rotate our points by multiplying them with one of the rotational numbers above, as needed. Ra-transform the points back from the rotational coordinates to their "native" ones: (r, s) -> (floor(r / 2), s, r mod 2), with "mod" defined as above. Re-transform the points back to their original position by adding them to the rotational centre (x, y, z) and normalising. * followed by halving all values (multiplication by (1/2, 0). * we might lose some information due to the last step. Not the answer you're looking for? Browse other questions tagged 2d rotation maps hexagonal-grid or ask your own question. How to orient a hexagonal tile on a geodesic sphere (Goldberg polyhedron)?